“Good morning!” My mind shouted as I woke up this morning. I got out of bed at 5:40 after 1 snooze with no hesitation and got ready for my first day of work. It’s been nearly 6 months since I last had to get out of bed to get money in my pocket. I’ve been living an easygoing potatoe life for half a year and I wonder how long this new job honeymoon time is going to last before I start missing it. As nice as the potatoe life sounds, it is stressful in your own way. Maybe I wouldnt be as stress if I were still living the no money life as I did throughout my whole college life lol. I’m too spoiled now, I want to shop, I want to dine out, I want to hangout and do all the fun stuff with no restrictions! So I am back to the full time office life again! I only woke up extra early today to eat breakfast downtown. My sister came with me to spend some time before work to ease my first day anxiety. We went to a cafe downtown name Bacco. It was on the priceier side but definitely delicious! 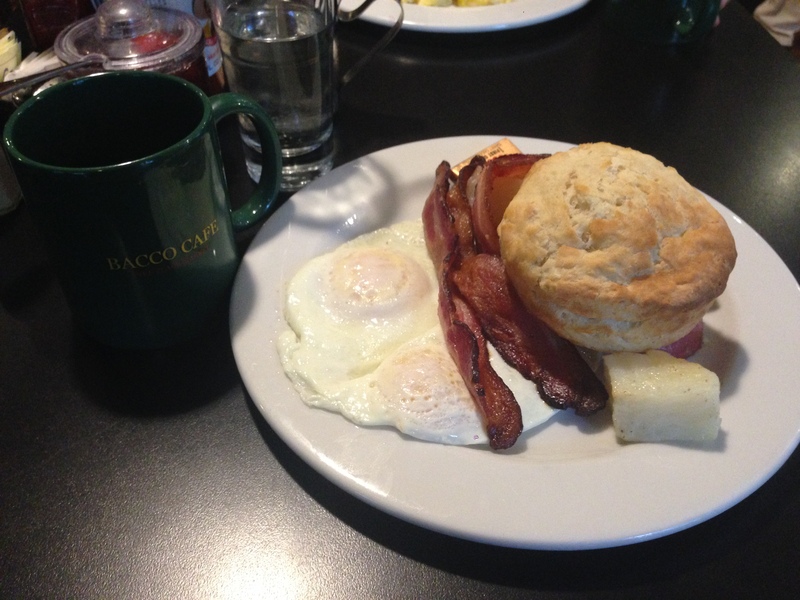 I got the Bacco Breakfast with overeasy eggs and bacon! What a dreamy breakfast, haha. I arrived at work and first thing I saw is my name on the digital board in the lobby Welcoming me along with 3 other new hires. Oh, that was pretty cool. Went through basic orientation, signed all the important documents then started to go theough training. Pretty basic stuff ao far. The office is definitely laidback in comparison to my last job. I could get up to use the bathroom whenever I feel like I need it, oh thank god for that. I tend to need to use the bathroom once every hour when I work… No joke. So far the first week seems to be a training week. Hope I learn enough to do my real work!